Alison Bruce is the author of two non-fiction novels and three novels in her DC Goodhew series. She has had a great love of music since her teens and this is reflected in her books. Any background information that you would like to share with us? Well, that’s a very open question! I’m the youngest of five children and there is 11 years between me and the next youngest so I was more like an only child when I was growing up and I think a lot of children who spend large amounts of time playing by themselves cultivate a very good imagination. I was think that that was the seed that eventually turned into the urge to write. When I left school I had no idea what I would do for a career and stumbled through a wide range of jobs before settling in IT for about 10 years. Amongst other things I trained as a riding instructor, worked as a dressmaker and taxi driver, had a Saturday job at a paint sprayers, a Monday job dressed as Andy Pandy and worked as an electro-plater at Britain’s first CD pressing plant. I can’t think of any career move, apart from becoming an author, which would actually make use of such a random employment history. My first published work was a six-line poem for Pony Club Annual for which I was paid £1. As a job? No, but I can’t remember a time when I wasn’t making up stories. I was a horse mad kid and I used to have an old roll of wallpaper and on the back I drew the map of a secret principality located within England. All the stories I invented involved either horses or spies and murder. 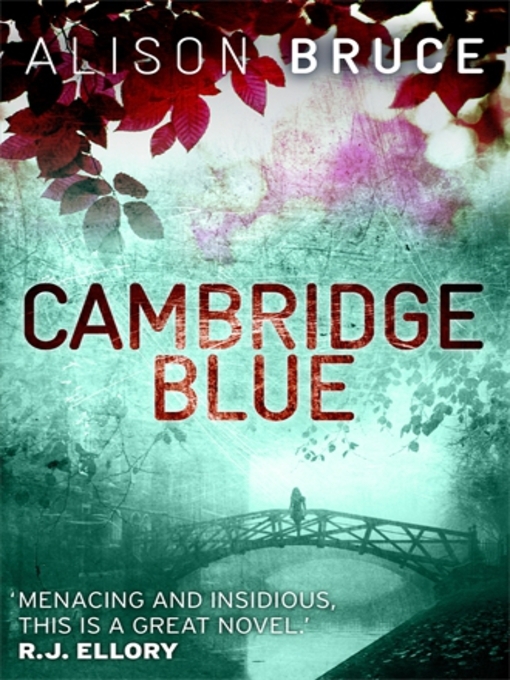 Before writing Cambridge Blue you wrote about the Cambridgeshire Murders and Billington, Victorian Executioner, what made you decide to write two non-fiction books and what then made you decide to switch tack and write Cambridge Blue? I am often asked this question but actually it is entirely the other way round. Whilst I was writing my first fiction novel I came to realise how tough it was going to be to get published and I heard that Sutton Publishing were looking for authors for their county murder series so I sent a proposal for Cambridgeshire Murders knowing that if I was successful I would make that vital first step and also be able to join organisations such as the CWA and the Society of Authors. Obviously research is paramount in non-fiction book but I also think a fiction author can bring the cases to life because they are used to thinking in terms of character, motivation and emotion. Was writing Cambridge Blue as difficult to write as you thought it was going to be? Cambridge Blue was not actually the first fiction book that I wrote and I expected it to be easier because of that. In fact, I suffered from the notorious second book syndrome and found the whole process incredibly tough. What was the impetus for the story in Cambridge Blue? The initial idea stemmed from the experience of coming into contact with someone who appeared to be good friends with all those around her but was actually unable to stop herself from stirring up trouble behind-the-scenes. Everybody liked her until cracks started to show in her story and in the end her work and home life disintegrated to the point where she had to move away. I realised that to some extent there are quite a few people who may not behave in such an extreme way but do possess some of those traits. In Cambridge Blue this is seen with the character called Lorna and she doesn’t survive for many chapters! How pleased were you with Cambridge Blue once you had finished writing it? Cambridge Blue went through various rewrites and although I am very pleased with it there are a couple of points that I would change if I had the opportunity, but then again the very nature of writing books means that there comes a point when you have to let go of the manuscript. The crime scene is particularly important in your novels, what made you decide to set your novels in Cambridge? I moved to Cambridge in 1998 and it made complete sense to set the novels here when the backdrop is not only world-famous, but has far more angles to it than many people are aware of. I like the fact that Cambridge is comparatively small and yet gives the impression of being such a major location. Cambridge is the kind of place where you can bump into people you know and not feel completely anonymous. Because of its cultural, academic, commercial and economic diversity almost anybody or anything you can think of might have a Cambridge connection. Is DC Goodhew based on anyone that you know? No he isn’t, but some of his quirkier traits I have seen in people I have met, for example, Goodhew has an almost photographic memory for dates and numbers and I used to work in an office with a man who would remember dates even minor things that happened throughout the 20 plus years he’d worked there. Goodhew is the detective that I wanted to find in books that I was reading, and more than anything else that is who he is. Your main protagonist is quite a difficult person. He constantly takes massive chances and finds it difficult to conform. Was this deliberate? Could you talk a bit about him without giving too much away? The funny thing is I don’t see him like that although I can see that the end result is that his behaviour comes across in that way. What Gary does is make logical decisions about what his next step should be, these are not always low risk or conducted with the right level of communication or authority however, each time he does something it is based on his firm belief that it is the right thing to do at that time. Gary has wanted to be a detective since just before his 12th birthday, which was also a very difficult time in his life. His grandfather died around this time leaving his parents with quite a substantial inheritance and Goodhew’s mother decided to send Gary and his sister Debbie to boarding school. Not only was this a miserable experience for Gary but also he came home to find that his parents’ marriage had crumbled. Gary, therefore, has a very negative associations with wealth. He didn’t fit in at boarding school and spent much of his time lost in old crime thriller movies and detective fiction leading him to develop and accentuated and slightly unrealistic view of right and wrong. Gary is the youngest detective in Cambridge, he has made it to that rank in almost record time and Cambridge Blue is his first murder investigation. Gary understands his responsibilities as a policeman but also believes that the difference between success and failure often boils down to personal determination and perseverance. That’s what pushes him to persist at moments when he really should turn away and do some paperwork instead. Will Gary ever leave Cambridge? And if not why not? Hah, a tricky question! If I answer this I will give too much away but if I were to say, “I don’t know” I would be lying. I like to be really open and honest with questions but in this case I’m not telling. When you are thinking about creating your characters what do you consider to be the most important thing to consider? It depends on the character, I do have quite a lot and some are small roles that maybe only appear on a single page. I always remind myself when watch passers-by that I am seeing tiny snapshots of real lives and sometimes that can be captured with something simple. For characters that are more substantial I usually write a fairly detailed back-story and I was like to know what is their biggest motivation and why. My dad was a reader and my mum a watcher. My mum would watch quite schmaltzy films but crime TV shows like Starsky and Hutch, Charlie’s Angels and Columbo. My dad would tut about the TV from behind his books but when I eventually had a look at his choice of literature I found he was reading Ed McBain. With both parents enjoying crime fiction in one form or another this the starting point for my own interest in murder. The first book I remember re-reading was that dark tale of child kidnap, 101 Dalmatians. When I find an author I enjoy I tend to stick with them for a number of books, from childhood to teens I liked the Famous Five, the Hardy Boys, Agatha Christie, Sherlock Holmes and Jane Eyre. I read Jane Eyre multiple times. As an adult my books of choice are mostly American thrillers, Harlan Coben, Linwood Barclay etc. I hadn’t read Sophie Hannah until recently but I can now say I am bang up-to-date! I don’t really gel with a book unless it has a body or two. If I had to list my all-time favourites I would have to include To Kill a Mockingbird, Jane Eyre and A Quiet Belief in Angels. What made you decide to write a series instead of standalone novels? The character of Gary Goodhew developed quite by accident. When I wrote my first novel I needed a policeman to appear in just one or two scenes and this is when I introduced him. As the book evolved so did his role and by the end of it the one character I really did not want to leave behind was Gary. Your second novel in the series is The Siren and there is a lot more about police politics in The Siren alongside the investigation that is taking place. How difficult was it to find that balancing at with two competing storylines? Even though I’m writing a series and therefore readers are able to get to know the characters and locations I don’t see any need to have great similarity between storylines. I would say that Cambridge Blue has elements of a traditional whodunnit whereas The Siren is more thriller like in certain ways. It hadn’t occurred to me that there were more police politics in The Siren but as the case involves a child abduction as well as a murder police investigation was much broader. The Calling is the most recent book in the series and this time around we have a profile killer, a kidnapping and a rather disturbed witness. Running parallel to all this is Kay’s story. Was there a particular incident that sparked off the idea for this story? The storyline of The Calling was the basis of the first novel I wrote and I absolutely love this book. Maybe that’s the equivalent of me cooing over baby photos, I don’t know but I can explain exactly how the plot arose. My first serious boyfriend didn’t treat me particularly well and, as is typical of many girls’ first serious relationship, I didn’t stamp it out. Eventually, he dumped me and I was left wondering what I had done wrong. A year or so later he started going out with someone else who bore an uncanny resemblance to me, she was eventually replaced and doppelgänger after doppelgänger followed. The whole experience was very creepy especially when I worked out that they all had the same favourite song, restaurant, romantic film and even the carbon copy proposal. I had been quite depressed at one point but started to consider the story that would develop if I had been a whole lot more depressed and he had been a whole lot creepier. Of course the final result is complete fiction and any comeuppance the bloke at any point along the way is purely coincidental! Each chapter heading is that of the date? What made you decide to do this? The Calling is told from multiple perspectives and not at an even pace so there are a couple of times when the time jump between chapters is far greater than others. Adding the dates to the chapters also gives the passage of time greater emphasis and adds to the ticking clock effect. I wrote the story that excited me; I didn’t set out to write a police procedural or to hit any particular crime subgenre. I was actually quite shocked when the first reviews came out and I saw it described as a police procedural. I enjoy police procedurals but I’m not sure that I have written a book that totally sits in that bracket (although Goodhew is obviously a police detective). It has been noted in various reviews that The Siren is ‘no tea sipping academic mystery’ and I’d like to think that the series would appeal to fans of the fast paced mystery-thriller. The upside of being linked to one subgenre is that those fans who read and enjoy your books know where to find them, but the obvious downside is that fans of other sub genres, to which your book equally fits, might not pick it up. I therefore suggest (without a hint of personal gain) that police procedurals should be the recommendation of the month. You have created soundtracks for Cambridge Blue and The Siren. Have you done a soundtrack for The Calling and if so can you let us know what is on it? As an example Since I Don’t Have You is playing on Goodhew’s jukebox whereas Desperado Love is one of my more obscure personal choices that was ideal inspiration for a chase scene. The fourth Goodhew book which has the catchy working title of Goodhew Book 4. Where do you write? Do you have a study and if so would you mind describing it to us? I have a desk in an alcove on our landing but in the summer the upstairs of the house becomes intolerably hot and I very often take my laptop downstairs and work in the kitchen, conveniently close to the kettle. I also take work out sometimes because a busy house can be tricky for concentration and I find it easier to work somewhere noisy where I am ignored than in a quiet room with the constant risk of interruption. Your husband is a musician, how much does music influence your work? I’m not musical but I have had a huge love of it since my teens and some of the first articles I wrote were reviews for music magazines. When Jacen is writing a song it is played constantly in the house until it is finished so it is not entirely favouritism that leads me to include one of his songs on the soundtrack, it is probably more the case that I have used the song being recorded a week as inspiration for the mood of a certain scene chapter. I wrote the lyrics to Bring Me Back Home and both The Siren and The Calling have songs written for them using my lyrics. For the first two Goodhew books we made a YouTube short and I’m sure we will do the same for the third. Mostly my not-writing time involves the children, Lana, 11 and Dean, six. Somehow between family, writing and ridiculous amounts of laundry that seem to appear from nowhere I don’t find too much time for anything else however I do enjoy playing pool and the occasional game of poker. My top tip for poker is don’t teach it to your 11 year old. 1 I think Dr Cream is far more exciting the Jack the Ripper. 2 One of my characters moans about the unlit bollards in Trinity Street, Cambridge because I fell over them at one a.m. while doing research (so beware when you leave Bodies in the Bookshop). 3 One of my ancestors is social reformer Jeremy Bentham. His dressed skeleton and waxwork head are preserved in a wooden cabinet at University College London. (They have the real head but locked it away after some student pranks). Does anyone have a better skeleton in their family cupboard than that I wonder?